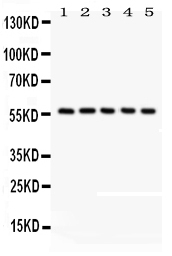 Rabbit IgG polyclonal antibody for Cyclic AMP-responsive element-binding protein 3-like protein 1(CREB3L1) detection. Tested with WB in Human. E.coli-derived human CREB3L1 recombinant protein (Position: M1-M204). Human CREB3L1 shares 93.6% and 93.1% amino acid (aa) sequence identity with mouse and rat CREB3L1, respectively. Expressed in several tissues, with highest levels in pancreas and prostate. Expressed at relatively lower levels in brain. .
Endoplasmic reticulum membrane ; Single-pass type II membrane protein. ER membrane resident protein. Upon ER stress, translocated to the Golgi apparatus where it is cleaved. The cytosolic N-terminal fragment (processed cyclic AMP-responsive element-binding protein 3-like protein 1) is transported into the nucleus. . Transcription factor involved in unfolded protein response (UPR). In the absence of endoplasmic reticulum (ER) stress, inserted into ER membranes, with N-terminal DNA-binding and transcription activation domains oriented toward the cytosolic face of the membrane. In response to ER stress, transported to the Golgi, where it is cleaved in a site-specific manner by resident proteases S1P/MBTPS1 and S2P/MBTPS2. The released N-terminal cytosolic domain is translocated to the nucleus to effect transcription of specific target genes. Plays a critical role in bone formation through the transcription of COL1A1, and possibly COL1A2, and the secretion of bone matrix proteins. Directly binds to the UPR element (UPRE)-like sequence in an osteoblast-specific COL1A1 promoter region and induces its transcription. Does not regulate COL1A1 in other tissues, such as skin (By similarity). Required to protect astrocytes from ER stress-induced cell death. In astrocytes, binds to the cAMP response element (CRE) of the BiP/HSPA5 promoter and participate in its transcriptional activation (By similarity). May play a role in limiting virus spread by inhibiting proliferation of virus-infected cells. Upon infection with diverse DNA and RNA viruses, inhibits cell-cycle progression by binding to promoters and activating transcription of genes encoding cell-cycle inhibitors, such as p21/CDKN1A (PubMed:21767813). Binds the DNA consensus sequence 5'-GTGXGCXGC- 3' (PubMed:21767813). .
CREB3L1, known as Cyclic AMP-responsive element-binding protein 3-like protein 1, is mapped to 11p11.2. The protein encoded by this gene is normally found in the membrane of the endoplasmic reticulum (ER). However, upon stress to the ER, the encoded protein is cleaved and the released cytoplasmic transcription factor domain translocates to the nucleus. There it activates the transcription of target genes by binding to box-B elements.